Wash, dry and using a fork, pierce 10 to 15 holes in the russet potatoes. Bake the potatoes for 1 hour on a sheet pan and set aside to cool. Pat the chicken breasts dry with paper towel and season well on all sides with kosher salt, pepper, oregano and granulated garlic and set aside. Cut the potatoes in half the long way and then again in quarters for each half. In a large oven safe skillet heat 2 Tbs of olive oil and sauté the quartered baked potato wedges until golden brown. Remove the crisp golden potato wedges and set on a paper towels to drain excess oil. In the same skillet add the chicken breasts skin side down and sauté for 3-4 minutes a side until golden brown. Add the whole peeled garlic and brown for about 1 minute then add the wine to deglaze the pan. Add the potato wedges and transfer the skillet to bake for 25 to 30 minutes. 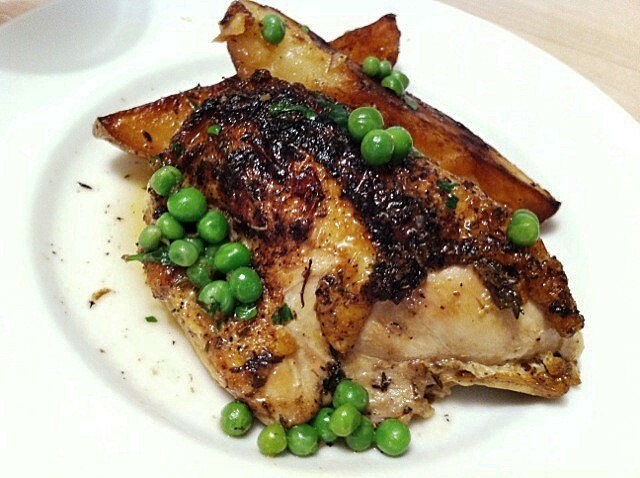 Place chicken on serving plate and arrange potatoes and roasted garlic cloves around chicken. Reduce the sauce to about 1 cup in the skillet on the stovetop with the heat on medium high. 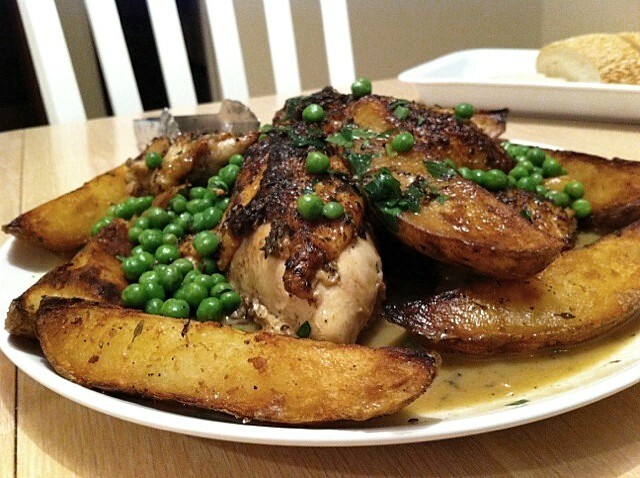 Turn the heat off and whisk in 1 Tbs of butter add the chopped parsley and peas to the sauce and pour over the chicken and potatoes on the serving platter and serve immediately.